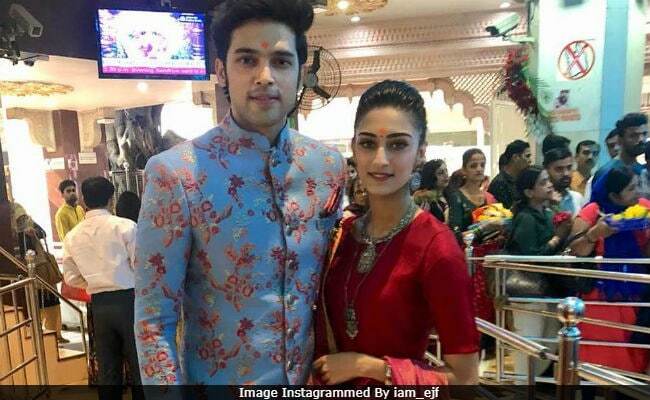 Kasautii Zindagii Kay lead stars Erica Fernandes (Prerna Sharma) and Parth Samthaan (Anurag Basu) found a top spot on Wednesday's trends list, after some picture of them from the Siddhivinayak Temple went viral. Erica and Parth visited the temple recently and the pictures were shared by the actress on her Instagram timeline. She was dressed in a red Indian outfit while Parth wore a blue and golden dhoti kurta set. Erica shared the post with a couple of emoticons. In just a few hours, their photos got close to 3 lakh likes. Going by Kasautii Zindagii Kay promos, Prerna and Anurag are likely to get married to each other this week. Here are the photos from Erica Fernandes and Parth Samthaan's visit to Siddhivinayak Temple. Kasautii Zindagii Kay is a reboot of Shweta Tiwari and Cezanne Khan's 2001 hit show of the same name. Shweta played Prerna, Cezanne was seen as Anurag and Urvashi Dholakia featured in Komolika's role. This time, Hina Khan plays Komolika. She is taking a break for some months from the show due to some other work commitments. "I am not quitting Kasautii..., but I am going on a break for five-six months, as I have given my nod to a movie. I will be back on the show whenever I am required. In the earlier season too, the track would change and Komolika would take a break and come back. As of now, I won't be seen post March," Hina told Bombay Times, adding that she also has to attend the Cannes Film Festival this year. Apart from Kasautii Zindagii Kay, Erica is best-known for Kuch Rang Pyar Ke Aise Bhi while Parth Samthaan has previously starred in shows like MTV Webbed, Yeh Hai Aashiqui and Kaisi Yeh Yaariyan.